10 Photos of the Lincoln Memorial in Washington, D.C.
Lincoln Memorial Photos in Washington, D.C. The Lincoln Memorial is one of the most iconic images in Washington, D.C. The stunning structure features seven-foot diameter columns that stretch 44 feet high. Architect Henry Bacon designed the monument in a style similar to a Greek temple. Abraham Lincoln was an inspiring leader and this monument is one of the most spectacular landmarks in the nation's capital. The Lincoln Memorial is an impressive architectural structure and one of the most popular attractions in Washington, D.C. The Lincoln Memorial continues to bring Americans together in struggles of freedom and is the site of many large public gatherings and protests in Washington, D.C. The Lincoln Memorial stands at the west end of the National Mall as a monument to America's 16th President, Abraham Lincoln. The National Mall serves as a place to honor the values of the nation and to reflect upon the country's history. Thousands of visitors come to the park daily. They take advantage of interpretive programming presented by park rangers and enjoy the panoramic views. Water swirls in the reflecting pool in front of the Lincoln Memorial. Part of the iconic image of Washington, D.C., the reflecting pool is lined by walking paths and shade trees on both sides. The Lincoln Memorial Reflecting Pool was designed by Henry Bacon and was constructed in 1922 and 1923. It was renovated and reopened in 2012. A 19-foot larger than life-size marble statue of Lincoln sits in the center of the Lincoln Memorial. The statue is surrounded by engraved readings of the Gettysburg Address, his Second Inaugural Address, and murals by French painter Jules Guérin. The statue of Abraham Lincoln was carved by the Piccirilli brothers under the supervision of the sculptor, Daniel Chester French. 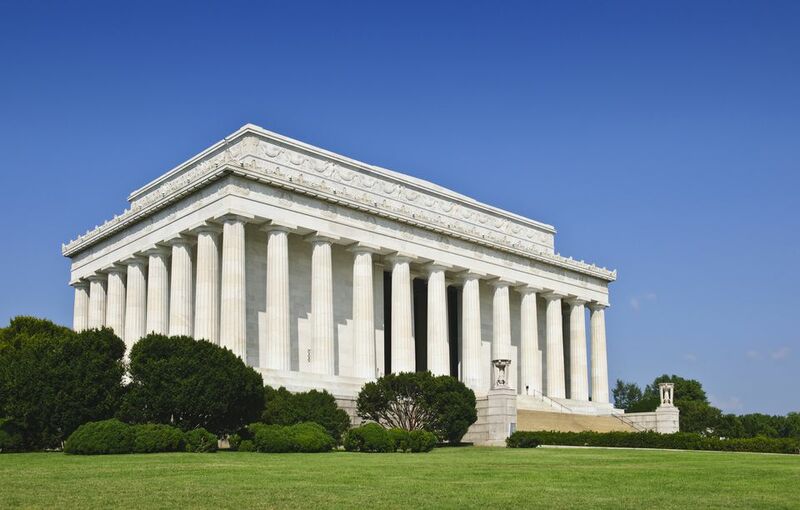 The Lincoln Memorial is one of the most spectacular national landmarks in Washington, D.C. This is the view of the memorial from the grounds of the Washington Monument where the American flags stand tall. This is one of the best vantage points on the National Mall to take in the views of some of the city's most famous landmarks. The Lincoln Memorial sits near the ​World War II Memorial. Dedicated in 2004, the memorial adds to the spectacular views along the National Mall. The Lincoln Memorial is beautiful when illuminated at night. The public may visit the location 24 hours a day. Rangers are on duty to answer questions from the early morning until the late evening, and they provide interpretive programs throughout the day and upon request. See a Map of the Monuments and Memorials in Washington, D.C.